When Scott Cook cofounded Intuit, in 1983, many other companies were already offering software to help people track their finances. In fact, at least 46 similar products launched before Quicken, the product Cook created, which is why we sometimes joke about how instead of having the first-mover advantage, Intuit had the “47th mover advantage.” The original version of Quicken offered only one-third the features that many competing products had, but with an important difference: It was well designed. Instead of looking like a spreadsheet, it displayed the familiar images of a check register and an individual check. Because the design made using the product so intuitive, Quicken immediately became the market leader in personal finance software. It has held that position for three decades. Over the years, however, we strayed from our focus on great design. By early 2008, when I became CEO, design wasn’t as central to the company. Our research found that the number one reason customers would recommend our products to others was “ease of use”—and the number one reason they wouldn’t recommend them was also “ease of use.” Ease of use and design are slightly different things, and we had become overly focused on adding incremental features and functionality that delivered ease but not necessarily delight. We needed to think about emotions—how customers felt about our products and whether they took pleasure in using them. We began talking about “design for delight.” I asked our employees to name the companies they thought were most innovative, and many of them mentioned Apple, Facebook, and Google. I wanted Intuit to be at the top of their lists. Great design would play a major role in that. Early in my tenure I set a long-term goal: By 2020 Intuit will be considered one of the most design-driven companies in the world. We’ve made great progress toward that goal. We’ve increased the number of designers at Intuit by nearly 600%. We now hold quarterly design conferences, and we routinely bring in people who’ve created beautifully designed products, such as the Nest thermostat and the Kayak travel website, to share insights with our employees. We’ve challenged everyone who works for us—even our lawyers and accountants—to think deeply about how design should be part of their jobs. And we’ve introduced innovative, smartly designed features that are helping our customers make a more emotional connection with the company—and increasing its market share. Although I care deeply about design, I don’t have much formal design training. I grew up in a small town in West Virginia and attended Marshall University, where I studied business administration. After college I spent seven years working in the packaged goods industry at PepsiCo and 7Up, and I earned a masters in management at night at Aquinas College in Michigan. After that I worked at Advo, a direct marketing company, and the payroll company ADP, where I started its first internet division. 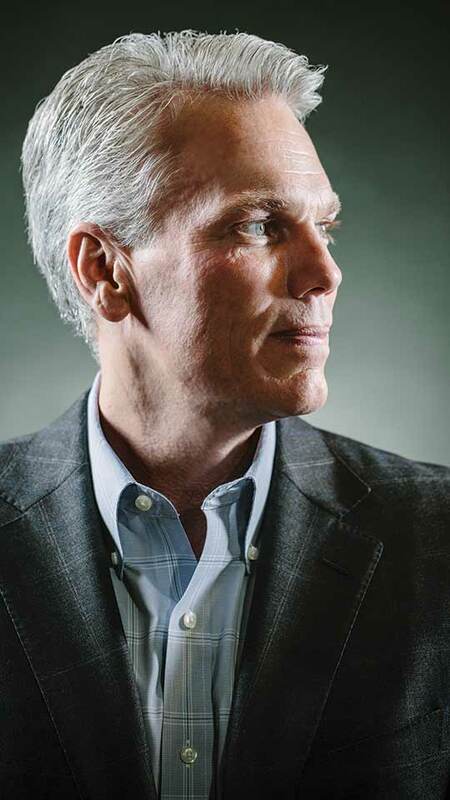 I was drawn to Intuit in 2003, and over the next five years I ran all three of its big businesses—the Accountant division (which builds relationships with accounting professionals), Consumer Tax (whose flagship product is TurboTax), and the Small Business division, which sells QuickBooks and payroll products. Even before I became CEO, I’d been working to help our teams understand what makes a product experience delightful. Ease of use is important, but it’s not everything. We began talking about customers’ end-to-end experience, which includes shopping, buying, and customer support. I started asking employees about the products and services they encountered in their own lives. Why do you love a product? What are the drivers of delight? And we developed D4D (design for delight), which clearly articulated Intuit’s approach to design thinking, based on deep customer empathy, idea generation, and experimentation. D4D is vital because it provides the entire company with a common framework for building great products. The challenge then was to integrate design thinking into every part of Intuit. In 2007 we used a day of our company leadership conference to get people thinking more broadly about design. We asked participants to bring in products that truly delighted them, and they took turns telling the group about their items. One person brought in an innovative backpack. Another spoke about a child’s sippy cup. I showed a wine opener that uses a CO2 cylinder as its power source. You stick a needle through the cork, and the device sends pressurized gas into the bottle, forcing the cork out. The exercise raised our awareness of great design but didn’t convert into as much action as we’d hoped. We kept looking for new ways to instill design thinking. To help things along, we even tried changing the layout of our office spaces. We reduced the number of cubes and added more areas for collaboration and impromptu work. We also began paying closer attention to how our competitors were using design to delight customers. A lot of the best design innovation comes from start-ups that are born in garages and dorm rooms. Two examples—Mint and ZenPayroll—are particularly relevant. Since its creation, Quicken personal finance software has required users to key in a lot of data. In the end the customer sees clear, well-presented budgets and pie charts, but patience may be required to reach that payoff. By 2009 Mint had found a great solution to this. Its founder built in features that allowed you to enter your bank password and download all your spending information automatically, eliminating data entry and showing you a pie-chart view of your finances in minutes. We liked the design of Mint so much that we acquired it. We’d always been aware of the deferred gratification element; now we measure the lag using the phrase “time to pie”—the number of minutes between when you begin using a program and when you get the first payoff. ZenPayroll inspired us to think differently as well. Most people consider the payroll function to be an administrative nuisance. ZenPayroll realized that the act of paying employees is a great opportunity to celebrate them and increase engagement. Its system sends employees notes along the lines of “Woo-hoo—it’s payday! You’re a rock star! Here’s your check!” It’s less formal and more whimsical than traditional payday procedures. The company is now an active partner on our QuickBooks Online platform. Slowly, design thinking began to take hold. We repeated the show-and-tell exercise with our leaders in 2012, and afterward we talked about what their chosen products had in common. Did they do the job they were supposed to do? Did they function more easily than expected? How did people feel while using them? Regardless of our roles in the company, each of us quickly realized that we recognized beautiful design when we encountered it and that we should be delivering the same experience to our customers. Consider TurboTax, our market-leading tax software. Consumers spend 6 billion hours each year using software to prepare their income taxes; anything we can do to reduce that time will be a gift. At the end of the process, most taxpayers are owed a refund—and for 70% of them, that refund is the single largest check they’ll receive during the year. In this context we began to think less about the pure functionality of our software and more about the emotional payoff of reducing drudgery and speeding the way toward a big windfall. We didn’t limit our conversations to employees directly involved in developing our products—we tried to get everyone thinking about design. We asked people in the finance department to consider how easy it is to submit a purchase order and whether that process could be streamlined. In HR we talked about the overall design of the job application and interview process—from the time candidates first encounter the employment section of our website right up to the moment someone is hired. Intuit has 8,000 employees, and we want them all thinking about how to improve the design of products and services, even if those offerings are intended for internal support only. Of course, talking and thinking about design wouldn’t accomplish much if it didn’t show up in our products. By early 2010 we were offering some enhancements to our customers. For instance, we began adding features to TurboTax that let people make more comparisons between years and import some information directly from year to year, limiting the number of questions the program asks them. From our research we know that among married couples, one partner usually takes responsibility for tax preparation, and the other spouse’s primary question is “Why is it different from last year?” With that in mind we designed several new features (which we referred to internally as “the Spouse Test”) to make it really clear what changed from year to year. We also came up with an app called SnapTax. This was driven by consumers’ migration to smartphones. Because preparing taxes requires inputting data, you’d think people wouldn’t want to do it on a mobile device. But our team played around with the idea of allowing users to take photos of their W-2 forms. The program automatically recognizes the data and inputs it directly into TurboTax. SnapTax was the first tool to allow people to completely prepare and e-file federal and state returns from their smartphones, and we were amazed by the response. Within two weeks of its release it had replaced Angry Birds as the number one app on iTunes. User reviews were astonishing. One person wrote, “I want this app to have my babies.” Another told us he was able to do his taxes from the bathtub with SnapTax. User after user gave it a five-star rating. It was a clear win for our D4D vision. We made many other, smaller changes. We began using emoticons in the customer interface. We revamped support and help functions in the software, streamlining them to be more intuitive; as a result, our phone service reps are receiving 24% fewer calls from confused users. We spent tens of thousands of hours working alongside customers to see how they actually use our products; as we did, we made notes with smiley faces next to elements that customers enjoyed and sad faces at places where they hit a snag—an example of using design to simplify the feedback mechanism. We’ve emphasized to engineers, product managers, and designers that functionality isn’t enough anymore. We have to build emotion into the product. In 2006 we had six designers at the executive level; today we have 35. We needed more design muscle to make all these changes, and now we have it. The designers report directly to the general managers of our product divisions, which gives them a seat at the table alongside engineers and product developers. Better design is showing up in our business results. TurboTax revenue grew by 7% in 2014, and the product gained two points of market share from competitors. In the early 2000s we used design to confront the shift toward “freemium,” in which many of our competitors were offering stripped-down versions of their software free to people online, hoping to persuade them to pay for upgrades and more features. We resisted pressure to make our version plain. If we were going to offer a free product, we’d make it the most beautiful free product on the market. Our motto became “Delight, don’t dilute.” That strategy worked: In the do-it-yourself tax software category, which includes “free” products, Intuit has a greater than 60% market share, whereas our next-largest competitor is at 18%. I think many companies find themselves in the position we were in a few years ago. Our product development process was too incremental and focused on features and ease of task completion. We needed an awakening and more of a grand vision. We needed all our people to understand that designing great products and user experiences is a team sport that includes not just designers and product managers but everybody else—even the CEO. Today we really are a customer-focused, design-driven technology company. And by 2020 we’ll be even better.